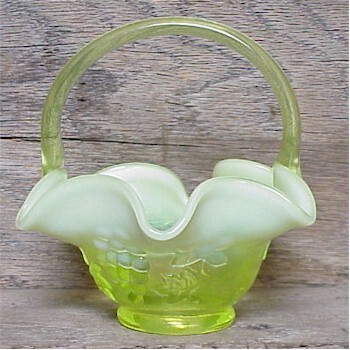 Grape Vine Basket in Vaseline Opalescent, Bargain Shack offers Boyd Glass, Mosser Glass, L.G. Wright, and Contemporary Collectible Glass including Vaseline Glass - J.B. Scottie Dogs, Pooche, Animal Covered Nests, Toothpick Holders, Salts, Glass Animal Figurines, Clowns, Dolls, Slippers, Vehicles, and More! This Grape Basket is simply stunning in Vaseline Opal with its raised grape and leaf pattern! This basket stands 4-1/2 inches tall and measures 4-1/2 inches across the top of the basket. The bottom of this basket is marked Gibson 2004. It glows like a firefly under a blacklight! This will be an exceptional vaseline glass item to add to your collection.